Recipe to cook Gluten Free Pizza. 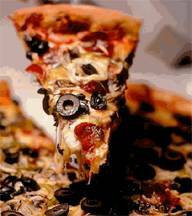 Now even those with wheat and gluten sensitivities and allergies can enjoy great tasting pizza. *Available at health food stores by Authentic Foods, Bobs Red Mill, and Ener-G Foods. Combine all ingredients in small saucepan and bring to boil over medium heat. Reduce heat to low and simmer for 15 minutes, while Pizza Crust is being assembled. Makes about 1 cup. Put mixture on 12-inch pizza pan or baking sheet (for thin, crispy crust), or 11 x 7-inch pan (for deep-dish version) that has been coated with cooking spray. Liberally sprinkle rice flour onto dough, then press dough into pan, continuing to sprinkle dough with flour to prevent sticking to your hands. Make edges thicker to hold the toppings. Bake pizza crust for 10 minutes. Remove from oven. Top Pizza Crust with sauce and your preferred toppings. Bake for another 20-25 minutes or until top is nicely browned.